As we wrap up our first round of Bs at the Curiosity Dispensary, I’m looking forward to seeing Flight of the Butterflies. This IMAX 3D movie depicts the astounding annual migration of millions of Monarch butterflies—from Canada, through the United States, down to Mexico—and documents how scientists spent four decades tracking down their “hidden” roosting sites in the Mexican state of Michoacan (actually known to local residents for centuries). I’m sure the movie will be a treat for the eyes. But according to Chip Taylor, a professor of ecology at the University of Kansas and director of the conservation group Monarch Watch, we shouldn’t take that colorful display of orange and black for granted. “The population is declining,” Taylor says. “There’s no question about that. It’s about half the size it was over a decade ago, and the reason is quite clear. It has to do with the loss of habitat. “We lose a lot of habitat [in the United States] due to development and due to our insistence on managing our roadsides so they look like somebody’s golf course,” Taylor says. Overuse of herbicides destroys the milkweed plants where Monarchs lay their eggs. Weather extremes, such as drought in the Midwest, also reduce the butterfly’s numbers. Monarchs must spend the winter in a place that’s cold, but not freezing. Those which emerge from the chrysalis in the late summer and early fall start arriving in the Transvolcanic mountains of central Mexico at the end of October. They settle in the trees there for several months, living off their fat supplies, Taylor explains. Returning to the United States, they lay their eggs before they die, and start the cycle all over again; their shorter-lived bring that show of color as far north as the milkweed grows in Canada. One natural show of color that many people dread is blushing. But according to this ASAP Science video, it can actually be useful as a sign of social remorse, making others look more favorably upon you after you’ve made a mistake. I wonder if theatre-goers in Shakespeare’s day ever blushed at the bawdy lines in his plays. Perhaps they were too busy snacking and drinking. Recent excavations of London theatres have helped recreate the play-watching experience in Elizabethan England. Discovery News features photos of some of those playhouse artifacts, now on display at the British Museum, including ceramic pots (for money collection), beer and wine goblets, costume beads, fruit pits, and shellfish remains. In addition to oysters, whelks, and cuttlefish, Shakepeare’s audiences apparently noshed on turtle, walnuts, grapes, peaches, plums, and figs. Julian Bowsher, senior archaeologist at the Museum of London Archaeology, describes some of the food finds in a post on the British Museum’s blog. British Archaeology magazine has a more detailed article (not available online) about the playhouse excavations. And for those who can’t get enough of the Bard, The Museum of London Archaeology and Cloak and Dagger Studios have put together a digital recreation of Shakespeare’s first theatre, built in 1576 in the district of Shoreditch. Londoners who wanted to sit for performances had to pay an extra penny, but your virtual seat is free. So sit down, take a tour of the 14-sided theatre, and maybe snack on some cuttleflish. 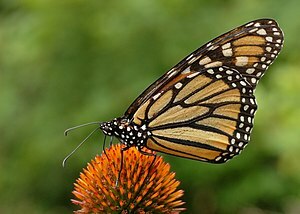 This entry was posted in Archaeology, Butterflies, Ecology, Shakespeare and tagged archaeology, blushing, butterfly, drink, food, London, Mexico, migration, Monarch butterflies, research, Shakespeare, theatre by Susan Frith. Bookmark the permalink.